This is the second of weekly Free Cooking Class based out of our kitchen in Dubai. We are going back to the basics because all of us could learn a tip or two from the professionals. I know that having married one, my kitchen skills have improved drastically (if you tell him I said that, I will deny it). As much as it can challenge the ego of any woman for a man to be giving her cooking tips, I will admit that many of these lessons have made my life easier and have also reaped more consistent results. You can continue viewing this in text and photos or view video. Usually, when I buy a whole chicken, that bird gets cooked whole, but that is awfully limiting! 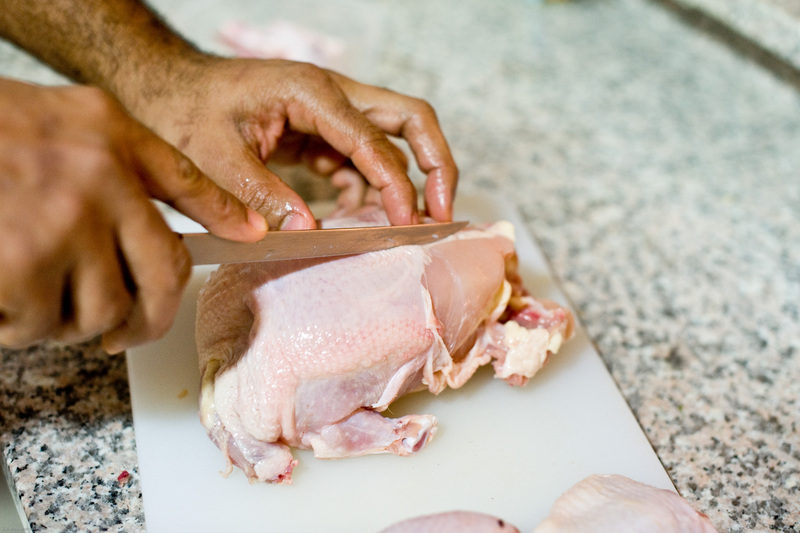 Handling raw chicken can be daunting for even the more adventurous people out there, but sometimes, you just have to do it. 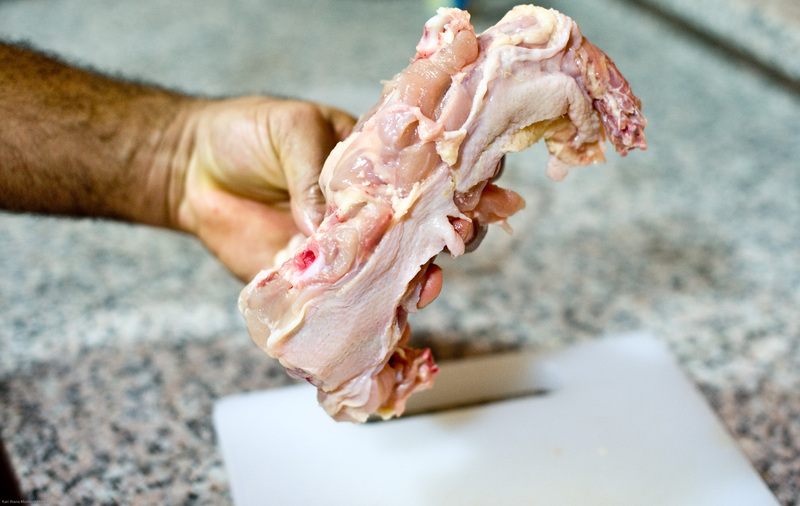 It is cheaper to buy the whole chicken and fabricate it yourself and it also gives you more parts to use for different things than if you bought parts. 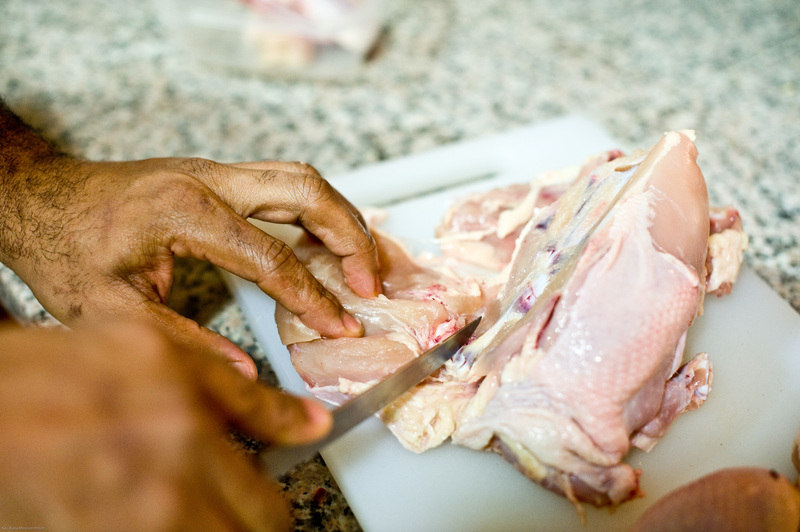 For example, you can use the back bones for stock and soup and collect the wings for your favourite chicken wing recipe. Now back to the dangling fowl! 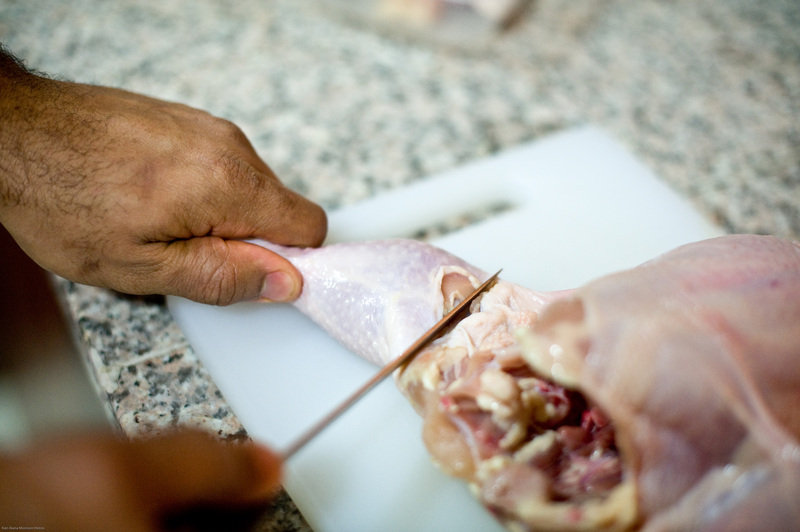 You will need: One whole chicken, a boning knife, a cutting board and a sense of humour. 1. Get rid of the bum. Hold on to the tail bits and slice it right off! 2. Off with the wings. Cut around the wing joints, snap them, then cut through in between the joints. 3. Spread that leg. You can see where the leg joins the thigh. It has a little fat deposit at the joint. Cut through it. 4.Thigh draw nigh. Lift up the thigh and cut through the skin between the thigh and the breast, bending the thigh backward until you see the ball socket. 5.Lay your hand upon the breast. You see that line that runs the length between both breasts? Keep an eye on it. Prepare to cut right along it. 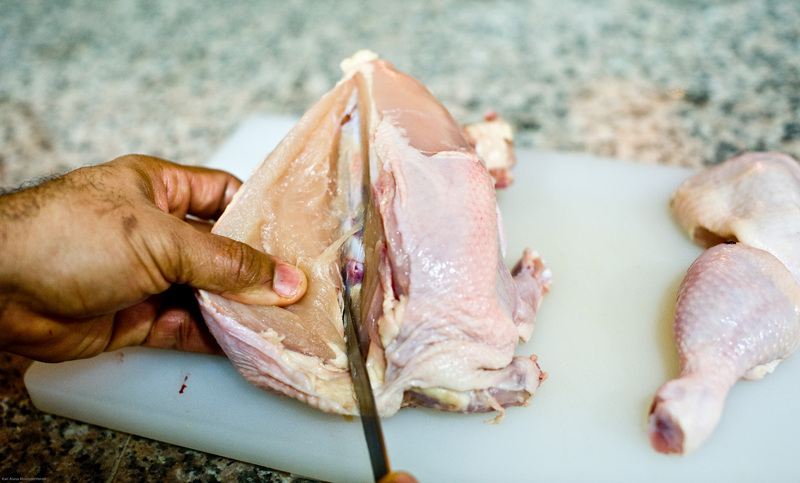 Continue cutting along the bones with delicate cuts using the tip of the knife and you will end up with perfect breasts. That is the wing ball and socket joint attached to the breast. You would leave that on if you were making a supreme, which is a semi boneless breast half. But we are yielding boneless breasts with this fabrication so cut through it. 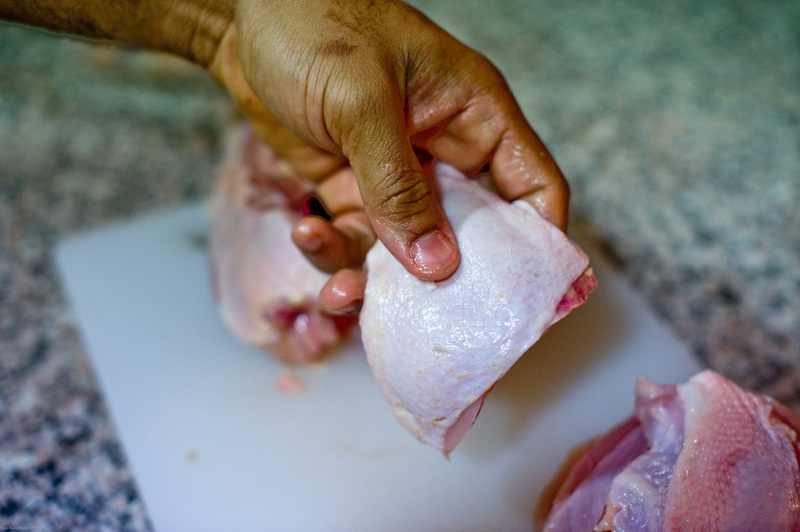 Repeat all steps for the other side of the chicken…. This is what will be left over. It’ s perfect for stocks and soups so please keep it handy! There you have it! One jointed bird ready for some herbs and spices and the heat treatment! 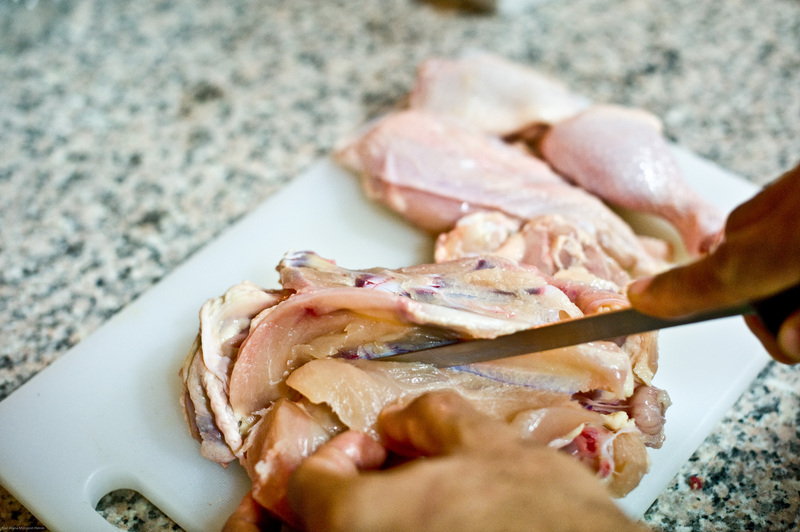 CHEF’S NOTE: Fabricated poultry will have a shorter cooking time than when whole. The breasts cook quicker than other red meat parts so you may want to cook those for a short period or cook them with things like veal bacon to retain moisture. Some think that breast meat is trashy and chewy. It isn’t. Overcooked breast meat is! 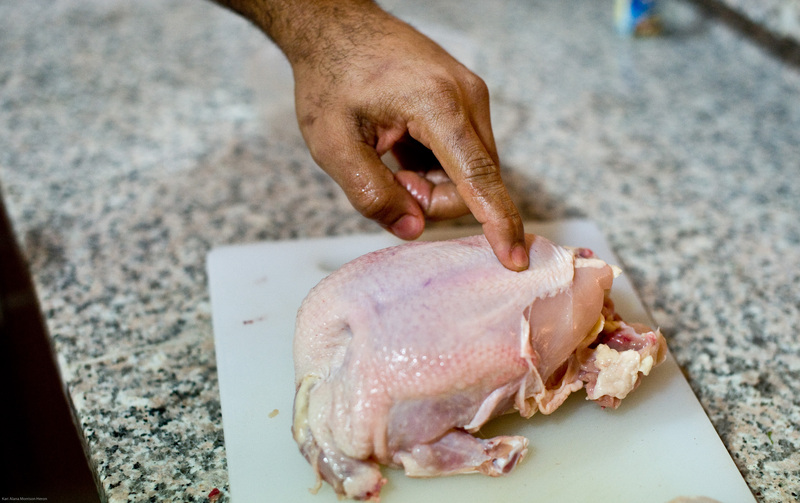 Cooked right, the breast is the most delicate part of the fowl. Remember to watch this video as well. 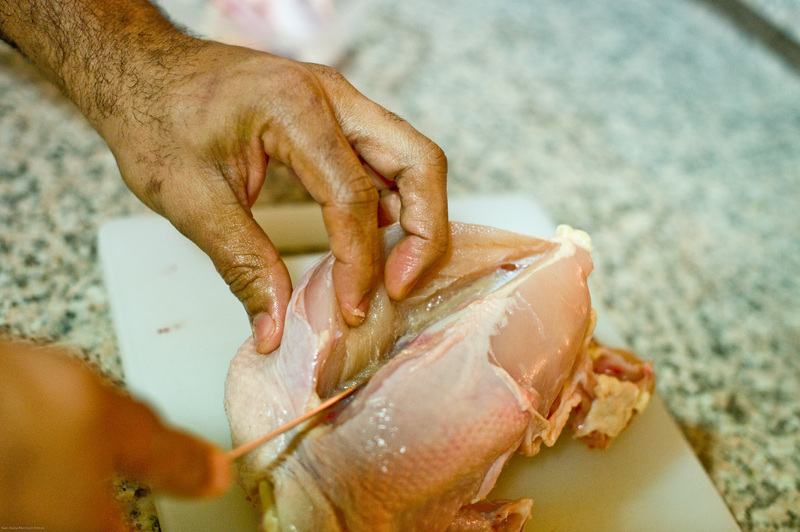 It can be a bit daunting to joint a chicken for the first time but your photos explain the process clearly. Thanks for connecting through the FB site and giving me the chance to discouver your food blog. Great pictorial tutorials which are beautifully photographed and so helpful. Looking forward to following your blog. i remember the first time i did this as a child for my jamaican mother. i cut up the chicken and seasoned it so all my mum had to do was cook when she came home from work. so from now on, i jerk, fry, stew 8 pieces. 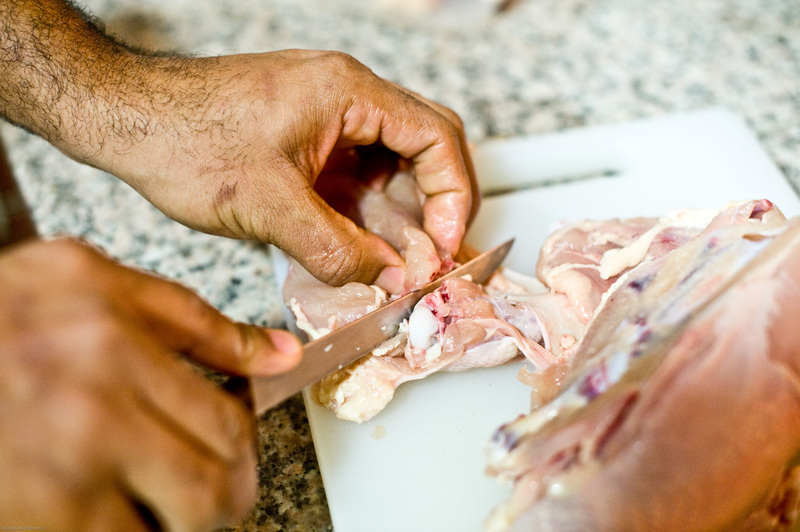 the bones in the back are tender and the meat is tasty…just a little trickier to deal with. 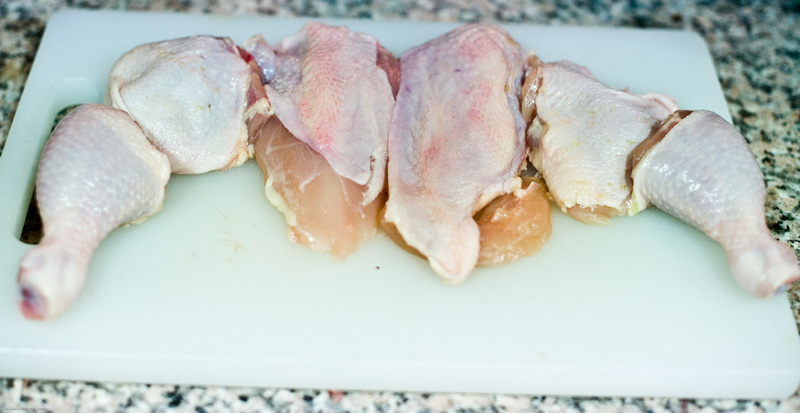 I must admit that I’ve never considered cutting up a chicken to get all the good bits. But I think after reading this I might, just MIGHT, give it a try soon. Thanks for the easy-to-follow steps! Thanks ladies. It makes it a little less daunting to have a static demonstration right in front of you doesn’t it? i always buy chicken parts because i just couldnt find the joints on these birds. many thanks. will refer to this when i am going to do it. I read somewhere about a person who would keep the excess chicken bits/bones and vegetable matter (ends of celery, greens of onions, potato and carrot skins, etc) in the freezer and then, when enough was accumulated, would make chicken stock with it. Is this a realistic option? I would really like to make homemade chicken stock, but buying whole vegetables just to make stock is a little costly for me. If I could use vegetable parts that would otherwise be thrown away, that would be much more economical. I wonder about keeping the chicken parts in the freezer though, and whether they would lose any flavor that way.